This article is about the U.S. state. For the island, see Aquidneck Island. For the former British colony, see Colony of Rhode Island and Providence Plantations. For other uses, see Rhode Island (disambiguation). Not to be confused with Rhodes. State song(s): "Rhode Island, It's for Me"
Rhode Island's official nickname is "The Ocean State", a reference to the large bays and inlets that amount to about 14 percent of its total area. Despite its name, most of Rhode Island is located on the mainland of the United States. Its official name is State of Rhode Island and Providence Plantations, which is derived from the merger of four Colonial settlements. The settlements of Newport and Portsmouth were situated on what is commonly called Aquidneck Island today, but it was called Rhode Island in Colonial times. Providence Plantation was the name of the colony founded by Roger Williams in the area now known as the city of Providence. This was adjoined by the settlement of Warwick; hence the plural Providence Plantations. Explorer Giovanni da Verrazzano noted the presence of an island near the mouth of Narragansett Bay in 1524 which he likened to the island of Rhodes (part of modern Greece). Subsequent European explorers were unable to precisely identify the island that Verrazzano had named, but the Pilgrims who later colonized the area assumed that it was this island. In recent years, the word plantation in the state's name became a contested issue, and the Rhode Island General Assembly voted on June 25, 2009 to hold a general referendum determining whether "and Providence Plantations" would be dropped from the official name. Advocates for excising plantation claimed that the word symbolized an alleged legacy of disenfranchisement for many Rhode Islanders, as well as the proliferation of slavery in the colonies and in the post-colonial United States. Rhode Island abolished slavery in 1652, but the law was not enforced and, by the early 18th century, it was "the epicenter of the North American slave trade", according to the Brown Daily Herald. Advocates for retaining the name argued that plantation was simply an archaic synonym for colony and bore no relation to slavery. The referendum election was held on November 2, 2010, and the people voted overwhelmingly (78% to 22%) to retain the entire original name. In 1636, Roger Williams was banished from the Massachusetts Bay Colony for his religious views, and he settled at the top of Narragansett Bay on land sold or given to him by Narragansett sachem Canonicus. He named the site Providence Plantations, "having a sense of God's merciful providence unto me in my distress", and it became a place of religious freedom where all were welcome. Samuel Gorton purchased lands at Shawomet in 1642 from the Narragansetts, precipitating a dispute with the Massachusetts Bay Colony. In 1644, Providence, Portsmouth, and Newport united for their common independence as the Colony of Rhode Island and Providence Plantations, governed by an elected council and "president". Gorton received a separate charter for his settlement in 1648 which he named Warwick after his patron. 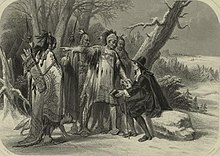 Metacomet was the Wampanoag tribe's war leader, whom the colonists called King Philip. They invaded and burned down several of the towns in the area during King Philip's War (1675–1676), including Providence which was attacked twice. A force of Massachusetts, Connecticut, and Plymouth militia under General Josiah Winslow invaded and destroyed the fortified Narragansett Indian village in the Great Swamp in South Kingstown, Rhode Island on December 19, 1675. In one of the final actions of the war, an Indian associated with Benjamin Church killed King Philip in Bristol, Rhode Island. The colony was amalgamated into the Dominion of New England in 1686, as King James II attempted to enforce royal authority over the autonomous colonies in British North America, but the colony regained its independence under the Royal Charter after the Glorious Revolution of 1688. Slaves were introduced in Rhode Island at this time, although there is no record of any law legalizing slave-holding. The colony later prospered under the slave trade, distilling rum to sell in Africa as part of a profitable triangular trade in slaves and sugar with the Caribbean. Rhode Island's tradition of independence and dissent gave it a prominent role in the American Revolution. At approximately 2 a.m. on June 10, 1772, a band of Providence residents attacked the grounded revenue schooner Gaspee, burning it to the waterline for enforcing unpopular trade regulations within Narragansett Bay. Rhode Island was the first of the thirteen colonies to renounce its allegiance to the British Crown on May 4, 1776. It was also the last of the thirteen colonies to ratify the United States Constitution on May 29, 1790, and only under threat of heavy trade tariffs from the other former colonies and after assurances were made that a Bill of Rights would become part of the Constitution. During the Revolution, the British occupied Newport in December 1776. A combined Franco-American force fought to drive them off Aquidneck Island. Portsmouth was the site of the first African-American military unit, the 1st Rhode Island Regiment, to fight for the U.S. in the unsuccessful Battle of Rhode Island of August 29, 1778. A month earlier, the appearance of a French fleet off Newport caused the British to scuttle some of their own ships in an attempt to block the harbor. The British abandoned Newport in October 1779, concentrating their forces in New York City. An expedition of 5,500 French troops under Count Rochambeau arrived in Newport by sea on July 10, 1780. The celebrated march to Yorktown, Virginia in 1781 ended with the defeat of the British at the Siege of Yorktown and the Battle of the Chesapeake. Rhode Island was heavily involved in the slave trade during the post-revolution era. In 1774, the slave population of Rhode Island was 6.3% of the total, nearly twice as high as any other New England colony. Rhode Island was also heavily involved in the Industrial Revolution, which began in America in 1787 when Thomas Somers reproduced textile machine plans which he imported from England. He helped to produce the Beverly Cotton Manufactory, in which Moses Brown of Providence took an interest. Moses Brown teamed up with Samuel Slater and helped to create the second cotton mill in America, a water-powered textile mill. The Industrial Revolution moved large numbers of workers into the cities, creating a permanently landless class who were therefore, by the law of the time, also voteless. By 1829, 60% of the state's free white males were ineligible to vote. Several attempts were unsuccessfully made to address this problem, and a new state constitution was passed in 1843 allowing landless men to vote if they could pay a $1 poll tax. Since the Great Depression, the Rhode Island Democratic Party has dominated local politics. Rhode Island has comprehensive health insurance for low-income children and a large social safety net. Many urban areas still have a high rate of children in poverty. Due to an influx of residents from Boston, increasing housing costs have resulted in more homelessness in Rhode Island. Rhode Island covers an area of 1,214 square miles (3,144 km2) located within the New England region and is bordered on the north and east by Massachusetts, on the west by Connecticut, and on the south by Rhode Island Sound and the Atlantic Ocean. It shares a narrow maritime border with New York State between Block Island and Long Island. The mean elevation of the state is 200 feet (61 m). It is only 37 miles (60 km) wide and 48 miles (77 km) long, yet the state has a tidal shoreline on Narragansett Bay and the Atlantic Ocean of 384 miles (618 km). Rhode Island is nicknamed the Ocean State and has a number of oceanfront beaches. It is mostly flat with no real mountains, and the state's highest natural point is Jerimoth Hill, 812 feet (247 m) above sea level. The state has two distinct natural regions. Eastern Rhode Island contains the lowlands of the Narragansett Bay, while Western Rhode Island forms part of the New England upland. Rhode Island's forests are part of the Northeastern coastal forests ecoregion. Narragansett Bay is a major feature of the state's topography. There are more than 30 islands within the bay; the largest is Aquidneck Island which holds the municipalities of Newport, Middletown, and Portsmouth. The second-largest island is Conanicut, and the third is Prudence. Block Island lies about 12 miles (19 km) off the southern coast of the mainland and separates Block Island Sound and the Atlantic Ocean proper. Most of Rhode Island has a humid continental climate, with warm summers and cold winters. The southern coastal portions of the state are the broad transition zone into subtropical climates, with hot summers and cool winters with a mix of rain and snow. The highest temperature recorded in Rhode Island was 104 °F (40 °C), recorded on August 2, 1975 in Providence. 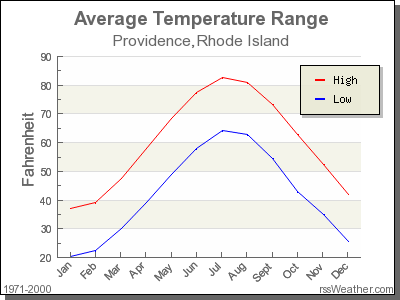 The lowest recorded temperature in Rhode Island was −23 °F (−31 °C) on February 5, 1996 in Greene. Monthly average temperatures range from a high of 83 °F (28 °C) to a low of 20 °F (−7 °C). The capital of Rhode Island is Providence. The state's current governor is Gina Raimondo (D), and the lieutenant governor is Daniel McKee (D). Raimondo became Rhode Island's first female governor with a plurality of the vote in the November 2014 state elections. Its United States Senators are Jack Reed (D) and Sheldon Whitehouse (D). Rhode Island's two United States Representatives are David Cicilline (D-1) and Jim Langevin (D-2). See congressional districts map. Rhode Island is one of a few states that do not have an official Governor's residence. See List of Rhode Island Governors. The state legislature is the Rhode Island General Assembly, consisting of the 75-member House of Representatives and the 38-member Senate. Both houses of the bicameral body are currently dominated by the Democratic Party; the presence of the Republican Party is minor in the state government, with Republicans holding a handful of seats in both the Senate and House of Representatives. Rhode Island's population barely crosses the threshold beyond the minimum of three for additional votes in both the federal House of Representatives and Electoral College; it is well represented relative to its population, with the eighth-highest number of electoral votes and second-highest number of House Representatives per resident. Based on its area, Rhode Island even has the highest density of electoral votes. Rhode Island is one of 19 states that have abolished capital punishment; it was second do so, just after Michigan, and carried out its last execution in the 1840s. Rhode Island was the second to last state to make prostitution illegal. Until November 2009 Rhode Island law made prostitution legal provided it took place indoors. In a 2009 study Rhode Island was listed as the 9th safest state in the country. The United States Census Bureau estimates that the population of Rhode Island was 1,057,315 on July 1, 2018, a 0.45% increase since the 2010 United States Census. 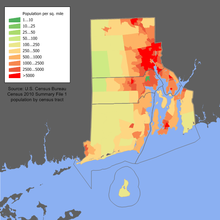 The center of population of Rhode Island is located in Providence County, in the city of Cranston. A corridor of population can be seen from the Providence area, stretching northwest following the Blackstone River to Woonsocket, where 19th-century mills drove industry and development. Rhode Island has the highest proportion of Roman Catholic residents of any state, mainly due to large Irish, Italian, and French-Canadian immigration in the past; recently, significant Portuguese and various Hispanic communities have also been established in the state. Though it has the highest overall Catholic percentage of any state, none of Rhode Island's individual counties ranks among the 10 most Catholic in the United States, as Catholics are very evenly spread throughout the state. The Blackstone River Valley was a major contributor to the American Industrial Revolution. It was in Pawtucket that Samuel Slater set up Slater Mill in 1793, using the waterpower of the Blackstone River to power his cotton mill. For a while, Rhode Island was one of the leaders in textiles. However, with the Great Depression, most textile factories relocated to southern U.S. states. The textile industry still constitutes a part of the Rhode Island economy but does not have the same power that it once had. 3 U.S. federal government 11,581 Excludes 3,000 active duty military personnel and 7,000 reservists, but includes 250 employees of the Naval War College. 7 Citizens Financial Group 4,991 The corporate headquarters are in Johnston. The East Bay Bike Path stretches from Providence to Bristol along the eastern shore of Narragansett Bay, while the Blackstone River Bikeway will eventually link Providence and Worcester. In 2011, Rhode Island completed work on a marked on-road bicycle path through Pawtucket and Providence, connecting the East Bay Bike Path with the Blackstone River Bikeway, completing a 33.5 miles (54 km) bicycle route through the eastern side of the state. The William C. O'Neill Bike Path (commonly known as the South County Bike Path) is an 8 mi (13 km) path through South Kingstown and Narragansett. The 19 mi (31 km) Washington Secondary Bike Path stretches from Cranston to Coventry, and the 2 mi (3.2 km) Ten Mile River Greenway path runs through East Providence and Pawtucket. In 2013, the "Lots of Hope" program was established in the City of Providence to focus on increasing the city's green space and local food production, improve urban neighborhoods, promote healthy lifestyles and improve environmental sustainability. "Lots of Hope", supported by a $100,000 grant, will partner with the City of Providence, the Southside Community Land Trust and the Rhode Island Foundation to convert city-owned vacant lots into productive urban farms. Some Rhode Islanders speak with the distinctive, non-rhotic, traditional Rhode Island accent that many compare to a cross between the New York City and Boston accents (e.g., "water" sounds like "watuh"). Many Rhode Islanders distinguish a strong aw sound [ɔə] (i.e., do not exhibit the cot–caught merger) as one might hear in New Jersey or New York City; for example, the word coffee is pronounced [ˈkʰɔəfi] KAW-fee. This type of accent may have been brought to the region by early settlers from eastern England in the Puritan migration to New England in the mid-17th century. Rhode Island, like the rest of New England, has a tradition of clam chowder. Both the white New England and the red Manhattan varieties are popular, but there is also a unique clear-broth chowder known as Rhode Island Clam Chowder available in many restaurants. A culinary tradition in Rhode Island is the clam cake (also known as a clam fritter outside of Rhode Island), a deep fried ball of buttery dough with chopped bits of clam inside. They are sold by the half-dozen or dozen in most seafood restaurants around the state, and the quintessential summer meal in Rhode Island is chowder and clam cakes. The quahog is a large local clam usually used in a chowder. It is also ground and mixed with stuffing or spicy minced sausage, and then baked in its shell to form a stuffie. Calamari (squid) is sliced into rings and fried as an appetizer in most Italian restaurants, typically served Sicilian-style with sliced banana peppers and marinara sauce on the side. Clams Casino originated in Rhode Island, invented by Julius Keller, the maitre d' in the original Casino next to the seaside Towers in Narragansett. Clams Casino resemble the beloved stuffed quahog but are generally made with the smaller littleneck or cherrystone clam and are unique in their use of bacon as a topping. The official state drink of Rhode Island is coffee milk, a beverage created by mixing milk with coffee syrup. This unique syrup was invented in the state and is sold in almost all Rhode Island supermarkets, as well as its bordering states. Johnnycakes have been a Rhode Island staple since Colonial times, made with corn meal and water then pan-fried much like pancakes. Submarine sandwiches are called grinders throughout Rhode Island, and the Italian grinder is especially popular, made with cold cuts such as ham, prosciutto, capicola, salami, and Provolone cheese. Linguiça or chouriço is a spicy Portuguese sausage, frequently served with peppers among the state's large Portuguese community and eaten with hearty bread. Slater Mill in Pawtucket was the first commercially successful cotton-spinning mill with a fully mechanized power system in America and was the birthplace of the Industrial Revolution in the US. The oldest Fourth of July Parade in the country is still held annually in Bristol, Rhode Island. The first Baptist Church in America was founded in Providence in 1638. Ann Smith Franklin of the Newport Mercury was the first female newspaper editor in America (August 22, 1762). Touro Synagogue was the first synagogue in America, founded in Newport in 1763. Pelham Street in Newport was the first in America to be illuminated by gaslight in 1806. The first strike in the United States in which women participated occurred in Pawtucket in 1824. Watch Hill has the nation's oldest flying horses carousel that has been in continuous operation since 1850. The motion picture machine (a machine showing animated pictures) was patented in Providence on April 23, 1867. The first lunch wagon in America was introduced in Providence in 1872. The first nine-hole golf course in America was completed in Newport in 1890. The first state health laboratory was established in Providence on September 1, 1894. The Rhode Island State House was the first building with an all-marble dome to be built in the United States (1895–1901). The first automobile race on a track was held in Cranston on September 7, 1896. The first automobile parade was held in Newport on September 7, 1899 on the grounds of Belcourt Castle. Rhode Island is the only state to still celebrate Victory over Japan Day which is officially named "Victory Day" but is sometimes referred to as "VJ Day." It is celebrated on the second Monday in August. Rhode Island is also home to the headquarters of the governing body for youth rugby league in the United States, the American Youth Rugby League Association or AYRLA. The AYRLA has started the first-ever Rugby League youth competition in Providence Middle Schools, a program at the RI Training School, in addition to starting the first High School Competition in the US in Providence Public High School. ^ "Rhode Island Government: Government". RI.gov. Retrieved July 31, 2010. ^ a b c Office of the Secretary of State: A. Ralph Mollis: State Library. Sos.ri.gov. Retrieved on July 12, 2013. ^ "Rhode Island". Merriam-Webster Dictionary. ^ "Constitution of the State of Rhode Island and Providence Plantations". State of Rhode Island General Assembly. Retrieved September 6, 2016. ^ "RG 042.03". Office of the Secretary of State: Nellie M. Gorbea. ^ Flexner, James Thomas (1984). Washington, The Indispensable Man. New York: Signet. p. 208. ISBN 978-0-451-12890-4. ^ Vile, John R. (2005). The Constitutional Convention of 1787: A Comprehensive Encyclopedia of America's Founding (Volume 1: A-M). ABC-CLIO. p. 658. ISBN 978-1-85109-669-5. Retrieved October 21, 2015. ^ "US constitution Ratification: RI". Usconstitution.net. January 8, 2010. Retrieved January 26, 2013. ^ This island is the largest of several islands in Narragansett Bay. ^ "Colony Of Rhode Island A Brief History". celebrateboston.com. Retrieved July 16, 2015. ^ "Rhode Island Geography Maps". Dlt.ri.gov. Retrieved January 26, 2013. ^ Verrazano, Giovanni. Verrazano's voyage along the Atlantic coast of North America, 1524. State University of New York at Albany. p. 10. Retrieved August 14, 2015. ^ Giovanni da Verrazzano named a place on Rhode Island Puntum Iovianum in honor of his friend Paolo Giovio (Jovium in Latin) (1483–1542), humanist and historian. Giovio owned the Cèllere Codex of Verrazzano containing the text of his first trip. ^ Samuel Greene Arnold (1859). "1636-1700". Appleton. p. 70 – via Google Books. ^ "Joannes de Laet". S4U Languages (in Portuguese). Retrieved December 11, 2015. ^ Elisha Potter (1835). The Early History of Narragansett. Collections of the Rhode-Island Historical Society, Volume 3. p. 22 – via Google Books. ^ Office of the Secretary of State: A. Ralph Mollis: State Library. Sos.ri.gov. Retrieved on April 12, 2014. ^ Hamilton B. Staples (1882). "Origins of the Names of the State of the Union". Proceedings of the American Antiquarian Society, Volume 1. p. 367 – via Google Books. ^ Wootton, Anne (October 17, 2006). "In colonial Rhode Island, slavery played pivotal role". Brown Daily Herald. ^ "Unfollowed abolishment of slavery in 1652 twist to Rhody's past". Warwick Beacon. November 18, 2010. Archived from the original on October 16, 2015. ^ Macris, Gina (November 3, 2010). "Strong 'no' to changing R.I. name". The Providence Journal. Archived from the original on November 6, 2010. Retrieved November 3, 2010. ^ "Charter of Rhode Island (1663)". Lonang.com. Retrieved July 31, 2010. ^ Ted Widmer, Brown: The History of An Idea (New York: Thames & Hudson, 2015), 42. ^ Michael Tougias (1997). "King Philip's War in New England". The History Place. Archived from the original on June 8, 2010. ^ "King Philip's War". Military History Online. July 17, 2004. Retrieved January 26, 2013. ^ "The Unrighteous Traffick". The Providence Journal. March 12, 2006. Archived from the original on September 12, 2009. Retrieved July 31, 2010. ^ gaspee.org. "Gaspee Affair Archive". Gaspee Virtual Archives. Retrieved August 20, 2012. ^ Dearden, Paul F (1980). The Rhode Island Campaign of 1778. Providence, RI: Rhode Island Bicentennial Federation. ISBN 978-0-917012-17-4. OCLC 60041024. ^ Duchesneau, John T., Troost-Cramer, Kathleen (2014). Fort Adams: A History. The History Press. pp. 16–19. ISBN 9781625850584. Retrieved March 15, 2017. ^ Ricardo Howell. "Slavery, the Brown Family of Providence, and Brown University". The Brown University News Service. Archived from the original on June 15, 2009. ^ The General Assembly of the Governor and Company of the English Colony of the Rhode Island (June 14, 1774). The Rhode Island Census of 1774 (Report). Hon. General Assembly. Retrieved September 20, 2016. ^ Bolles, John Augustus (1842). The Affairs of Rhode Island, Being a Review of President Wayland's Discourse, a Vindication of the Sovereignty of the People, and a Refutation of the Doctrines and Doctors of Despotism. Boston: B.T. Albro. Retrieved June 9, 2015. ^ Webster, Daniel (1848). The Rhode Island Question: Mr. Webster's Argument in the Supreme Court of the United States in the Case of Martin Luther vs. Luther M. Borden and Others, January 27th, 1848. Washington, D.C.: J. and G.S. Gideon. Retrieved June 9, 2015. ^ Pitman, Joseph S. (1844). Report on the Trial of Thomas Wilson Dorr, for Treason Against the State of Rhode Island, Containing the Arguments of Counsel, and the Charge of Chief Justice Durfee. Boston: Tappan & Dennet. Retrieved June 9, 2015. ^ King, Dan (1859). The Life and Times of Thomas Wilson Dorr, with Outlines of the Political History of Rhode Island. Boston: Dan King. Retrieved June 9, 2015. ^ "Rhode Island History: CHAPTER V: Change, Controversy, and War, 1846–1865". Archived from the original on February 3, 2006. Retrieved March 28, 2006. ^ McLoughlin, William G (1986). Rhode Island: A History. New York: W.W. Norton & Company. pp. 148–168. ISBN 978-0393302714. ^ "Rhode Island History: CHAPTER VII: Boom, Bust, and War, 1900–1945". Archived from the original on March 2, 2006. Retrieved March 28, 2006. ^ Robert Smith (April 26, 1999). "In the 1920s the Klan Ruled the Countryside". The Providence Journal. Archived from the original on July 22, 2011. ^ "Providence Neighborhood Profiles". Archived from the original on April 25, 2006. ^ Butler, Brian (February 21, 2003). "Nightclub Fire Kills 39 People". CNN. ^ Official Government Web Portal for the State of Rhode Island www.ri.gov/facts/history.php accessed May 24, 2014. ^ "Elevations and Distances in the United States". U.S Geological Survey. April 29, 2005. Archived from the original on November 2, 2006. Retrieved November 7, 2006. ^ Olson, D.M. ; Dinerstein, E.; et al. (2001). "Terrestrial Ecoregions of the World: A New Map of Life on Earth". BioScience. 51 (11): 933–938. doi:10.1641/0006-3568(2001)051[0933:TEOTWA]2.0.CO;2. Archived from the original on October 14, 2011. ^ "cumberlandite". U.S Geological Survey. ^ "Average Temperature Range". Retrieved January 26, 2013. ^ a b Leip, David. "General Election Results – Rhode Island". United States Election Atlas. Retrieved November 18, 2016. ^ "Democrat Gina Raimondo becomes Rhode Island's first female governor". Reuters. Retrieved January 23, 2015. ^ "New Jersey Presidential Election Voting History". 270towin.com. Retrieved January 26, 2013. ^ "Registration and Party Enrollment Statistics" (PDF). RI Secretary of State. Retrieved March 14, 2011. ^ "Number of Solidly Democratic States Cut in Half From '08 to '10". Gallup.com. Retrieved January 26, 2013. ^ "CNN Election Results by town in Rhode Island". Retrieved January 6, 2009. ^ Eric Tucker. "Rhode Island police seek stricter anti-prostitution laws". Union-Tribune Publishing Co. Retrieved April 13, 2008. ^ "Safest States". Walletpop.com. Retrieved January 26, 2013. ^ "RI Gov. Chafee signs bill allowing civil unions". WHDH-TV 7NEWS WHDH.COM. Archived from the original on January 17, 2013. Retrieved January 26, 2013. ^ David Klepper (May 2, 2013). "Rhode Island Becomes 10th State With Gay Marriage". Archived from the original on May 21, 2013. ^ a b Downing, Neil. "Rhode Island taxes rising, now seventh in the country". Archived from the original on December 11, 2007. Retrieved April 24, 2008. ^ Resident Population Data. "Resident Population Data – 2010 Census". 2010.census.gov. Archived from the original on December 20, 2012. Retrieved December 24, 2012. ^ a b "QuickFacts Rhode Island; UNITED STATES". 2018 Population Estimates. United States Census Bureau, Population Division. March 12, 2019. Retrieved March 12, 2019. ^ "Population and Population Centers by State: 2000". US Census Bureau. Archived from the original on September 18, 2008. Retrieved April 24, 2008. ^ "Rhode Island QuickFacts from the US Census Bureau". Quickfacts.census.gov. Archived from the original on October 15, 2010. Retrieved August 14, 2012. ^ a b "Historical Census Statistics on Population Totals By Race, 1790 to 1990, and By Hispanic Origin, 1970 to 1990, For The United States, Regions, Divisions, and States". Census.gov. Archived from the original on July 25, 2008. Retrieved February 26, 2014. ^ "Cannot GET /city/RI". January 11, 2014. Archived from the original on January 11, 2014. Retrieved November 26, 2018. ^ 2010 Census Data. "2010 Census Data". Census.gov. Retrieved February 26, 2014. ^ "American FactFinder – Results". census.gov. Archived from the original on August 15, 2014. Retrieved December 11, 2015. ^ "2010 Census quick facts: Rhode Island". U.S. Census Bureau. Archived from the original on October 15, 2010. Retrieved November 8, 2010. ^ "Language Map Data Center". Mla.org. July 17, 2007. Retrieved July 31, 2010. ^ "Rhode Island QuickFacts". U.S. Census Bureau. Archived from the original on October 15, 2010. ^ "Rhode Island – Race and Hispanic Origin: 1790 to 1990". U.S. Census Bureau. Archived from the original on July 25, 2008. ^ "Obama grants 12-month extension to Liberians on DED". The Providence Journal c/o The African Media Network. Archived from the original on April 18, 2009. Retrieved January 4, 2009. ^ "U.S. Religion Map and Religious Populations – U.S. Religious Landscape Study – Pew Forum on Religion & Public Life". Religions.pewforum.org. Retrieved February 26, 2014. ^ "The Largest Roman Catholic Communities". Adherents.com. 2000. Retrieved February 13, 2009. ^ "City and Town Population Totals: 2010-2017". Quickfacts.census.gov. March 12, 2019. Retrieved March 12, 2019. ^ "Homepage of the Town of South Kingstown". Retrieved April 5, 2013. ^ "Slater Mill". Slater Mill Historic Site. Retrieved April 13, 2008. ^ "Providence: Economy – Major Industries and Commercial Activity". Advameg, Inc. Retrieved April 13, 2008. ^ "Rhode Island Economy at a Glance". US Dept. of Labor. Retrieved April 13, 2008. ^ "Rhode Island Has the Highest Salaries for Elementary School Teachers in US". GoLocalProv. Retrieved January 23, 2015. ^ "Nation's Largest Banks". Nyjobsource.com. June 30, 2009. Retrieved July 31, 2010. ^ "Fortune 500 2009: Top 1000 American Companies – Exxon Mobil – XOM". CNN. Retrieved July 31, 2010. ^ "State-Level Energy Consumption, Expenditures, and Prices, 2004". US Dept. of Energy. Retrieved April 13, 2008. ^ "Energy consumption per capita, 2003". US Census Bureau. Archived from the original on April 14, 2008. Retrieved June 26, 2008. ^ "Energy Consumption: Red State and Blue State Comparisons". sustainablemiddleclass.com. Archived from the original on June 2, 2008. Retrieved June 26, 2008. ^ "Massachusetts ranks No. 1 in energy efficiency". The Boston Globe. Archived from the original on January 5, 2012. ^ Kuffner, Alex (October 20, 2011). "RI moves up in state energy efficiency rankings". The Providence Journal. Archived from the original on 2011-11-27. ^ "Local Area Unemployment Statistics". Bureau of Labor Statistics. Retrieved January 26, 2013. ^ "Facts about Rhode Island". Visitrhodeisland.com. Archived from the original on May 12, 2008. Retrieved April 13, 2008. ^ "State Individual Income Taxes" (PDF). Federation of Tax Administrators. Archived from the original (PDF) on April 14, 2008. Retrieved April 13, 2008. ^ "Carcieri signs law changing income tax structure". Projo 7 to 7 News Blog | The Providence Journal. June 9, 2010. Archived from the original on June 13, 2010. Retrieved July 31, 2010. ^ "R.I. General Assembly approves income tax overhaul". The Providence Journal. June 5, 2010. Archived from the original on June 13, 2010. Retrieved July 31, 2010. ^ "CHAPTER VIII, The Era of Transition. 1946–1983". Chapter VIII:Era of Transition. State of Rhode Island General Assembly. December 29, 2009. Archived from the original on September 2, 2012. ^ "Top Employers in Rhode Island" (PDF). Rhode Island Economic Development Corporation. March 2011. Archived from the original (PDF) on July 18, 2013. ^ "General Dynamics Electric Boat". Gdeb.com. Retrieved January 26, 2013. ^ "RIPTA: No Newport ferry service in 2010". Pbn.com. December 7, 2012. Retrieved January 26, 2013. ^ "Block Island Ferry". Block Island Ferry. Retrieved January 26, 2013. ^ "Prudence Island Ferry". Prudenceferry.com. October 15, 2012. Retrieved January 26, 2013. ^ Marthas Vineyard Ferry. "Vineyard Fast Ferry". Vineyard Fast Ferry. Retrieved January 26, 2013. ^ "Viking Fleet". Viking Fleet. Retrieved January 26, 2013. ^ "State of Rhode Island: Department of Transportation: Intermodal Planning". 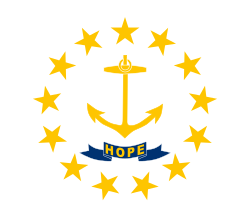 Dot.state.ri.us. October 27, 2010. Archived from the original on January 17, 2013. Retrieved January 26, 2013. ^ "Providence Journal | Rhode Island news, sports, weather & more". Projo.com. Archived from the original on September 14, 2011. Retrieved January 26, 2013. ^ "EPA Awards $17.5 Million to Clean Up Brownfield Sites in New England; Funds help protect health, the environment and Revitalize communities". Retrieved December 24, 2014. ^ "Providence Environmental Initiative Will Transform Vacant City-Owned Parcels into Urban Farms". Retrieved December 24, 2014. ^ "Rhode Island First State in Nation to Prohibit School Construction on Vapor Intrusion Brownfield Sites – Clean Water Action". Archived from the original on December 24, 2014. Retrieved December 24, 2014. ^ RI.gov (July 20, 2000). "RI Government Facts and History". Ri.gov. Retrieved January 26, 2013. ^ "Body of Proof". Film.ri.gov. Archived from the original on January 17, 2013. Retrieved January 26, 2013. ^ "Body of Proof". Abc.go.com. Retrieved January 26, 2013. ^ a b c d e f g h i j k l m n "Rhode Island history and facts of interest" (PDF). Rhode Island State Library. Archived from the original (PDF) on October 27, 2004. Retrieved August 28, 2007. ^ "Slater Mill Today". Slater Mill Historic Site. Retrieved August 28, 2007. ^ "The First Baptist Church". The First Baptist Church in America. Archived from the original on January 13, 2010. ^ "Terminal Improvement Project". Rhode Island Airport Corporation. Archived from the original on August 13, 2007. Retrieved May 13, 2008. ^ Michael Kusterman. "United States:Rhode Island". PlatesUSA.com. Archived from the original on April 20, 2008. Retrieved April 13, 2008. ^ "Quahog.org: Rhode Island Beaches". Quahog.org. Retrieved May 30, 2007. ^ Don D'Amato. "Warwick's Villages & Historic Places". City of Warwick. Archived from the original on September 27, 2007. Retrieved April 13, 2008. ^ Nesi, Ted. "Here's why Rhode Island is the only state that celebrates Victory Day". WPRI. Retrieved March 27, 2019. ^ "Home > State Library > History of Rhode Island > State Facts & Figures". Rhode Island Office of the Secretary of State. Retrieved September 24, 2013. ^ "NFL History by Decade". Nfl.com. Archived from the original on April 10, 2016. Retrieved January 26, 2013. ^ Ian Bridge (February 18, 2011). "Inaugural USARL Line-up Announced". league13.info. Archived from the original on August 9, 2011. Retrieved March 24, 2011. ^ "USARL Constitution & Teams announced". usarl.com. USA Rugby League. February 18, 2011. Archived from the original on May 13, 2011. Retrieved March 24, 2011. ^ "MAIN". Rebellion-rugby.com. June 6, 2012. Retrieved January 26, 2013. ^ "High School Rugby League Kicks Off in USA". USARL.com. November 14, 2013. Archived from the original on November 18, 2013. Retrieved November 14, 2013. ^ "State Capitol". VisitRhodeIsland.com. Archived from the original on April 28, 2008. ^ "Who built the Newport Tower?". Newport Tower Museum. Retrieved September 28, 2016. "Slavery in Rhode Island". Slavery in the North. Retrieved July 31, 2010.